Kicked off . Inside and outside the hall was full of the news media, the arts and culture as well as dignitaries come here for art lovers and others . Europe , Mr. Yang went to the site , the reception guests, interviews, too busy. But see Europe Yang haircut, Chunfengmanmian , high-spirited , in pink shirt against the background, a face peach , increasingly look younger. 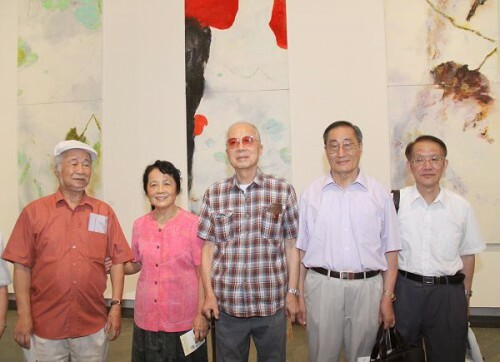 In addition to the exhibition site Mr. Yang Zhiguang , there are also famous sculptor Mr. Pan He , a famous writer , Mao Dun Literature Prize winner Mr. Liu Sifen , etc., can be described as Sheng- clouds, high friends full house . Into the hall, only a sense of refreshing and pleasant , warm and tranquil blowing, neither most vivid painting exhibition , makeup " identical " and " monotonous " , nor did most countries crafted paintings , water ink stained halo " delicate " and " light " , totally not "deja vu " feeling. 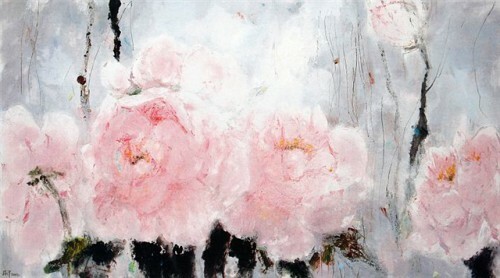 Ou Yang 's paintings is spectacular , unique , refreshing , away. 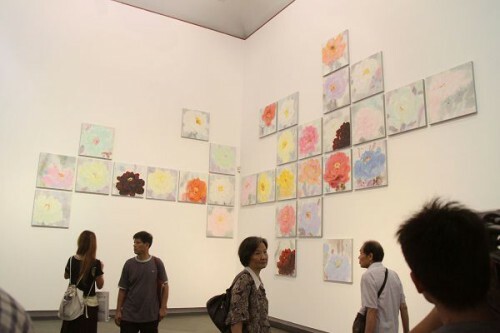 The exhibition most attractive "image " word , we know that "image" is used more classical Chinese painting and Chinese poetry ; while Western oil painting of painting , heavy " concrete" , impressionist paintings , then heavy " abstraction . " With Europe , Mr. Yang 's own words : Her imagery oil industry to " concrete" and "abstract" , between "like " and " do not like" between . "Imagery painting" is really a new concept. "Image" , such as " fur ", " Yi" does not exist , "like" adhere to ? It comes from the endless thinking "meaning" just so colorful Health issued "elephant ." Mr. 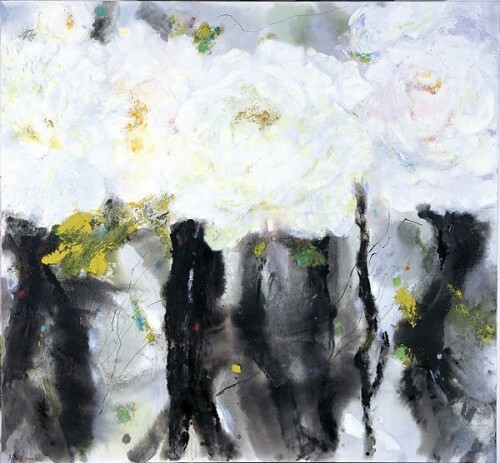 Au Yeung imagery painting, such as the song reverberates Chhnang , fresh and crisp like poetry, like the chilly mellow wine , people dreamlike, mesmerizing. 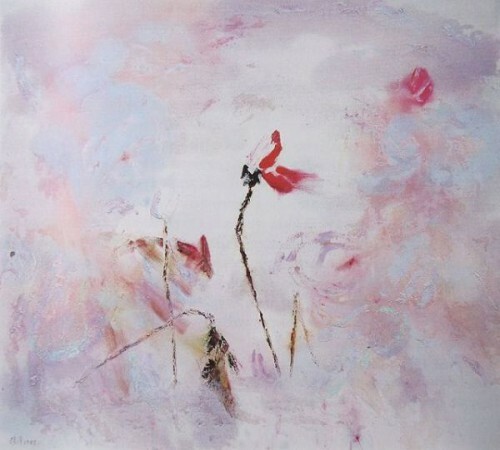 Yang 's painting tours Europe , should listen to the song Na Ying : "smoke and mirrors , moon in water , you can tell that the vagaries of the world ...... " "Water Waltz " feels exactly was " unpredictable " , red is a flower ? Green is a leaf ? Rotation curve is a wave or storm ? Despite knowing " hazy " is a kind of beauty, or want to " lend me a pair of eye ", "Let me see these troubles clearly, plainly , genuineness ." Screen such as waltz -like , seems to have been in the rotation, you could not tell that the wind moving leaves , or flowers in the stream , but the whole picture lively rhythm , smooth melody can best be exciting . Yang 's painting tours Europe , should Faye Wong sings the song: " see smoke rising , twilight cover the earth . Ask bursts of smoke, where are you going ? Sunset is poetic , dusk picturesque ...... " or shallow Yin Du Mu " Yanlong cold moon in the water cage yarn . " "Sunset red" painting is the sunset of the lotus leaf lotus, "Twilight cover the earth " when the faint smoky Hechi , such as every yarn Mochizuki , carved zero Cuiye , folded saffron faintly discernible , evening mist -shrouded , do not with poetic. Yang 's painting tours Europe , should chant Pi Rixiu of the Franz Marc paintings " unparalleled in the world competing boast brilliant , independent human first incense ." " Aromatic" , very words of the rich beauty of peony . Peony in Chinese traditional painting depicting a massive , but works mostly depict peony meticulous pursuit of the shape , see more, inevitably feel tacky. Europe Western painting peony ( "Golden Age " series ) , informal shape , and even intentionally exaggerated its image and color to render its splendid , noble, while the use of impressionist techniques, a breakthrough in light and color , draw very different with the traditional fresh vivid , brilliant without demon peony come . Yang 's painting tours Europe , should chant Tang Bai little words: " Claustrophobia , fog fog ...... came out as a non- Dreaming little while, and go like asakumo in hunting ." "Flower - Non- flower, mist - non- fog " , giving a sense of uncertainty ; " Dreaming "," asakumo " short and easy to disillusionment , giving the feeling is still elusive . " Passage ", the decline or still growing and uncut lotus leaf , lotus carved zero or Xie , are or will be the crowd, disappeared in the water flow , and our Love, dust will eventually like Stronghold things like blowing in the river of time li . Gone is the trend of life , is the law of the universe , the EU foreign paintings reveal the most simple philosophy. Because you want to die you can swim ? No, ocean pen in Europe , can not find the shadow of decadence , it is because you want to die , so should treat time as gold , vibrant place to live.